ABC News co-anchor Bob Woodruff and a cameraman were seriously injured Sunday when the Iraqi Army vehicle they were traveling in was attacked and a roadside bomb exploded, the network said. The two journalists were with U.S. and Iraqi troops near Taji, about 12 miles north of Baghdad, ABC News President David Westin said. Both suffered serious head injuries and underwent surgery at a U.S. military hospital in Balad. Vogt also broke his shoulder. They are in stable condition and will be transferred to medical facilities in Landstuhl, Germany, overnight. Woodruff and Doug Vogt, an award-winning cameraman, had been embedded with the 4th Infantry Division. They were wearing body armor and helmets when the device exploded, but they were standing up in the hatch of the Iraqi armored vehicle, exposed to the shrapnel, the network said. No one else was hurt in the explosion. ABC said the men were traveling in the Iraqi mechanized vehicle to get the perspective of the Iraqi military. They were aware the Iraqi forces are the frequent targets of insurgent attacks, the network said. "If you're going to cover the Iraqi military, you have to go with them, you have to see how they live," said ABC News correspondent Martha Raddatz, reporting on the attack on ABC's "This Week" Sunday. The U.S. military confirmed that Woodruff and Vogt were injured in an attack near Taji and said an investigation is under way. CBS News correspondent Lara Logan, who has covered Iraq, said the Taji area is considered particularly dangerous because it was the site of one of Saddam Hussein's munitions dumps. Many of the explosives are believed to have gotten into the hands of insurgents, she said. "I admire Bob for going with the Iraqis," said Logan, who was blown 12 feet in the air by an explosion while with the U.S. military in Afghanistan in 2003. "It's important to hear their story and to experience it from their point of view. He did the right thing." Woodruff, 44, became co-anchor of ABC News' "World News Tonight" with Elizabeth Vargas earlier this month, replacing the late Peter Jennings. In an unusual approach to evening news shows, one of the two co-anchors frequently reports from the studio in New York while the other reports from the field, as Woodruff was doing in Iraq. Last week, Woodruff spent three days in Israel reporting on the outcome of the Palestinian elections. He was to have been in Iraq through the State of the Union address on Tuesday, according to ABC. Woodruff, a father of four, grew up in Michigan and became a corporate lawyer in New York. While on a leave of absence to teach at a school in China, he helped CBS News during the Tiananmen Square uprising and became hooked on journalism. He has since covered the Justice Department and reported from Iraq, Afghanistan, Belgrade and Kosovo. "When I realized there was a job that existed in this world where I could be in the middle of huge world events and actually get paid for it, it was an epiphany for me," Woodruff told The Associated Press in a recent interview. Vogt, 46, is a three-time Emmy award winning cameraman from Canada who has spent the last 20 years based in Europe covering global events for CBC, BBC and now exclusively for ABC News. He lives in Aix-en-Provence, France. Vogt was recently in another convoy in which someone was killed by another improvised explosive device but Vogt wasn't injured. "They've covered all the wars, the hot spots," said ABC News' Jim Sciutto, who is covering the war in Iraq. "The best we have with Doug. He's the cameraman we all request when we go to the field because he's so good, a fantastic eye. He's won so many awards for ABC." On CBS's Face the Nation Sunday, anchor Bob Schieffer abandoned his commentary to wish Woodruff and Vogt well. "Wars are not fought on the training ground, nor can they be covered from a TV studio," Schieffer said. "They are not reality shows, they are reality. Young men and women have to fight them, and correspondents have to cover them if we are to understand what they are about." Dozens of journalists have been injured, killed or kidnapped in Iraq since the 2003 U.S.-led invasion that toppled Saddam Hussein. Jill Carroll, a freelance reporter for The Christian Science Monitor, was kidnapped by gunmen Jan. 7. She was among 250 foreigners who had been taken captive in the country since the U.S. invasion; at least 39 of those foreigners were killed. 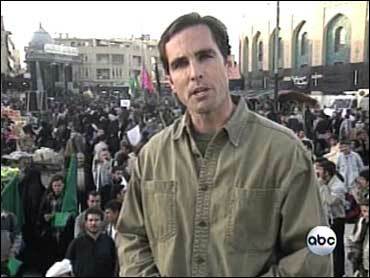 The most visible among the U.S. TV reporters was David Bloom of NBC News, who died from an apparent blood clot while traveling south of Baghdad on April 6, 2003. The Blooms and Woodruffs were known to be close friends, and when NBC News executives had to tell Bloom's widow that her husband had died, they made sure Lee Woodruff was there to offer support.